Kick-off of our Masterclass in Data Journalism 2018 with Carsten Brosda (Minister for Culture and Media) in Hamburg: 13 participants from Belarus, Czech Republic, Germany, Lithuania, Poland, Russia and Ukraine take their skills to the next level and use them in cross-border data journalism projects. The program runs until June. The Interlink Academy for International Dialog and Journalism is offering a data journalism master class in Hamburg, Germany. ​The course is aimed at young and working journalist from Eastern European countries as well as from Germany. The participants are going to work on data-driven cross-border projects and publish their results. “Master Class in Data Journalism 2018” is a blended-learning program. It consists of two stages: a high-powered attendance phase at the beginning of the course in Hamburg, Germany, and a subsequent e-learning phase. The attendance phase in Hamburg will take place April 4-8, 2018. 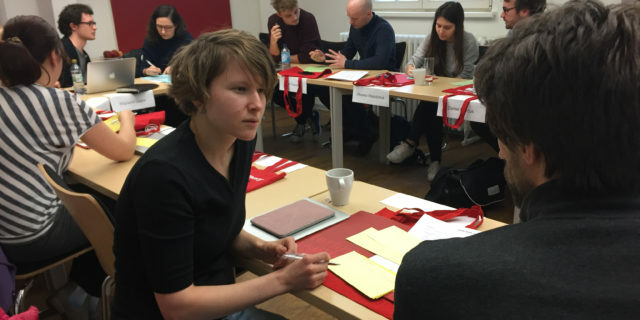 During their study stay in Hamburg, the participants acquire new journalistic skills in intensive sessions of lectures, practical group work, and discussions, with continued support from the teaching staff. After their visit to Hamburg, participants are going to work in international teams during the 6-week-long e-learning phase. The participants put into practice what they have learned at the Interlink Academy and work on international data journalism projects. Networking and sharing the newly gained knowledge with their colleagues back home will also play an important part in the program. After the end of the course, successful participants will be awarded a certificate of excellence. The Interlink Academy remains in close contact with the participants through its Alumni and mentoring services. Courses at the Interlink Academy are run by highly specialized lecturers and trainers from Germany and abroad who have considerable experience with international study groups. We pay great attention to the journalistic expertise of lecturers as well as their experience as educators. The lead trainer of this course is Interlink’s data journalism expert Claus Hesseling. The program is sponsored by the Rudolf Augstein Stiftung Foundation, the Hamburg Media School, and the ZEIT-Stiftung Ebelin and Gerd Bucerius Foundation. Further support is given by the Free and Hanseatic City of Hamburg. There is no tuition fee. Foreign participants receive a scholarship grant to cover international travel costs. During the attendance phases, they are housed in guesthouses or hotels at the expense of the Interlink Academy and receive an adequate meal allowance. Applicants are expected to have demonstrated their journalistic talent as a member of an editorial team or as a freelancer. ​Basic knowledge in data journalism and Excel/spreadsheet software is mandatory. The e-learning phase serves to deepen and strengthen the knowledge and skills acquired during the first attendance phase. Applicants must have a good command of English (written and spoken), as the whole program is conducted in English. The Interlink Academy expects salaried editorial staff to be released from their duties for the duration of the attendance phases, while continuing to be paid by their employer, and to receive appropriate support from them during the e-learning phase. Freelance journalists should ensure that they are able to pay their ongoing costs in their home country during their stay in Germany. The attendance phase in Germany may require participants to compromise on their traditional diet and daily routine. Please note that the program can also involve physical challenges, such as carrying heavy equipment over long distances. Applicants must be in possession of valid international travel documents. Applications will be accepted only from February 18 to March 4, 2018.